Netherlands striker Klaas Jan Huntelaar has signed a two-year contract extension with Schalke, ending rumours about a switch to the Premier League. 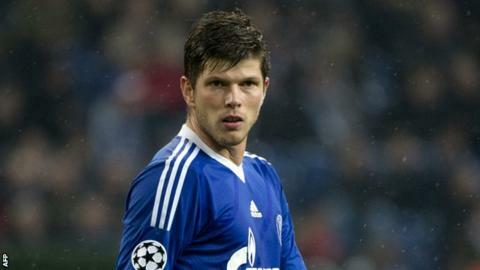 Huntelaar, 29, was out of contract in the summer, but has now signed with the Bundesliga side until 2015. The former Heerenveen, Ajax and Real Madrid player had been linked with a January move to Liverpool or Arsenal. Huntelaar has scored 49 goals in 107 games for Schalke since joining from Italian giants AC Milan in 2010. The forward, who has also netted 34 times in 59 appearances for his country, said: "I have thought long and hard about this decision and I am very grateful to my managers at Schalke 04, who have have given me this time. "But now I have made ​​the decision, in which I have the best feeling. I've always felt comfortable at Schalke, the club and its fans."